Offers ample tooth strength for G8 Series Heavy Duty Drive Chains, with a reinforced hub. The bore keyway has 43% higher allowable surface pressure. All Tough Tooth sprockets have hardened teeth to improve their wear resistance. A special coating that enhances tooth hardness is also available as an option. Optimal for harsh usage conditions and environments where you want to reduce both sprocket and chain replacement frequency. The coating gives the surface a Vickers hardness of over 800 for enhanced wear resistance. Torque is calculated from the keyway's allowable surface pressure where a JIS standard parallel key (1) is used with maximum bore diameter. Single/double strand B and C type sprockets have been standardized for RS60 and above Heavy Duty Drive Chains. 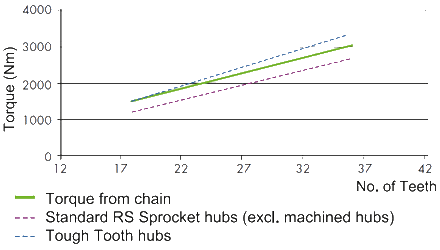 The transverse pitch of teeth on RS Roller Chain sprockets differs from RS-HT and Super-H Chain. Other sizes, numbers of teeth, and hub dimensions are available as MTO products. Shaft bore finishing is also available. Uses carbon steel for machine structural use for the teeth and hubs. This is a made-to-order product. 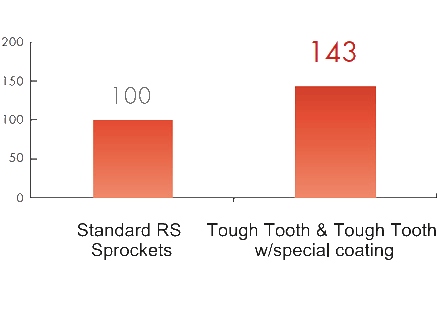 Sprocket features a coating that provides over HV800 hardness to the teeth to increase wear resistance. Effective in harsh usage conditions and environments where sprocket replacement frequency is high. Shaft bore finishing available as an MTO product. Based on customer drawings we can quote the shaft, manufacture, and deliver as a set with the sprocket. An inspection report can reduce man-hours and cost for inspection and integration at the customer's site. Coating is available for outer diameters less than φ350 and weights under 10kg. Contact a Tsubaki representative for more information on specialty products not shown above. Contact a Tsubaki representative for more information on dimensions and other items not shown above. Other sizes, numbers of teeth, and hub dimensions are available as MTO products. The transverse pitch differs for RS-HT Chain and multi-strand (2 or more) Super-H Chains.